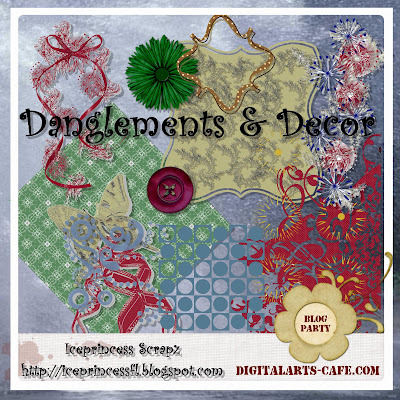 The Digital Arts Cafe Blog Party has begun, and you're invited to grab loads of FREEBIES from December 1 through 7, 2008. Click on the above image to download my part and then come back here to get a list of participating blogs by clicking here. Please show these scrap-fabulous people some appreciation for volunteering these freebies to you by leaving some great comments on their blogs when you visit them. By clicking on the above image you can grab these quickpages and bragbook pages that I made using KayJay's Digital Arts Cafe Blog Party freebie kit. Thanks, KayJay, for the use of your funtastic kit! 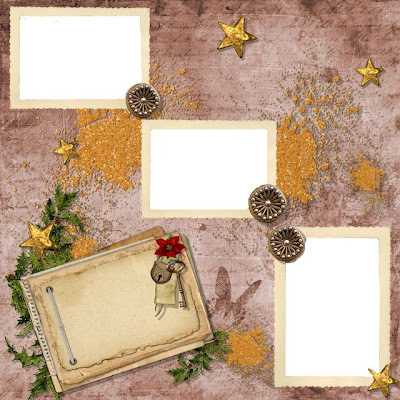 And if that's not enough, here's a quickpage I made using Adelina's Digital Arts Cafe Blog Party freebie kit and her "Must Be Santa" kit. Hop on over to Adelina's blog to grab it. Thanks, Adelina, for the use of your kits! Happy Digital Arts Cafe blog hoppin'!!! Thanks for all the wonderful goodies!! They are delicious!! Love the kit and the QP's!! Thanks! Great pages and dangles, TSMFS!! wow so many great freebies in here :) thanks for joining the party! Thank you very much for your beautiful Christmas gift and the lovely bonus quick pages!! You ladies are so generous!